My grandparents loved to cook spicy foods, especially pasta, and they had many recipes to suit the men in the family. Our main meat dishes were pork, veal, beef and chicken. On holidays such as Easter, we would have something special, usually a kid, or young nanny goat, or a skinned rabbit. Both were famous and tasty dishes in Italy and here in America. At one time, we became owners of a pig, which we kept in a barn at the rear of our house. The barn had once been a horse barn before we lived there. The pig weighed about 150 pounds. My job was to feed the pig and have it gain weight. This took approximately one year. When it was time to kill the pig, no one in the family knew how, so we hired a butcher. His fee was a share of the pig, how much I don't recall. However, we enjoyed many pork dinners because of that pig. When the pig was slaughtered, its blood was preserved. My mother had a recipe for making some kind of blood pudding. She would mix the blood with grain, rice and a few other ingredients. It was very tasty if you didn't know what it was made of. During the special holidays when butchers would kill a great many pigs, we would have to place our order for the blood several weeks before to the slaughter. For some people, you see, pig's blood was a sought-after specialty item. At that time, it was selling for $2 or $3 a gallon. We only owned the one pig that I can remember, but I saw many pigs in my younger years. 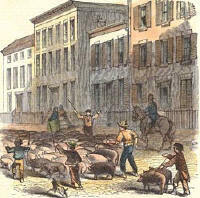 There was a commercial slaughter- house located on Avenue L and Wilson Avenue, not too far from our home. I used to go there about once every month to purchase the so-called trimmings. These trimmings were the internal fat tissues of the pig. My parents would cook them up and make cooking lard or fat for household use. We would cook up a five gallon can full of fat that would last us all winter. I used to go to the slaughterhouse often enough to be offered a complete tour of the processing plant--from start to finish. Alongside the slaughterhouse, there was a corral where the railroad cattle cars would discharge the pigs. The pigs would enter the pens one at a time. They would be sorted out and at the end of the sorting they would still be in single file in the corral. There was a man standing there selecting the pigs that he thought looked better than some of the others. These were the choice pigs. He would throw a small chain around the pigs' rear legs and they would be picked up and hooked to an overhead moving conveyor which carried them, hanging by one hind leg, up to the second floor of the slaughterhouse. Once the pig had reached the second level, it was met by a butcher standing there with a long knife. He stabbed the pig in the neck and pushed him down the overhead chain to the next service position, which was about 50 feet further away. The pig was supposed to be dead at the end of that 50 feet. Then, still with the chain hooked to its hind leg, the pig's carcass went into a tank of boiling water-- about 15 feet wide and 25 feet long. It was in the boiling tank just long enough for two men to unhook the pig from the overhead chain and place it on a waist-high platform about 10 feet long and eight feet wide. Two men were on either side of the platform ready with bailing hooks to remove the pig's toenails. The front nails were removed by one man, and the hind nails by the other. Then the pig was pushed down to the end of the platform where both hind legs were attached to the main overhead conveyor, and transported to the next operation, which was the most hideous job of all. A butcher would slash the pig open from its hind legs to its neck and release all the intestines. It was a sight to see. All the internal organs would drop out and hang down toward the neck of the pig. Then a man would hose down the pig's carcass and prepare it for inspection. A city health inspector would check the inner carcass and look for signs of infection or blemishes on the pig. If it was OK he would stamp a mark of approval on the outside, and from there, it was readied for shipment.